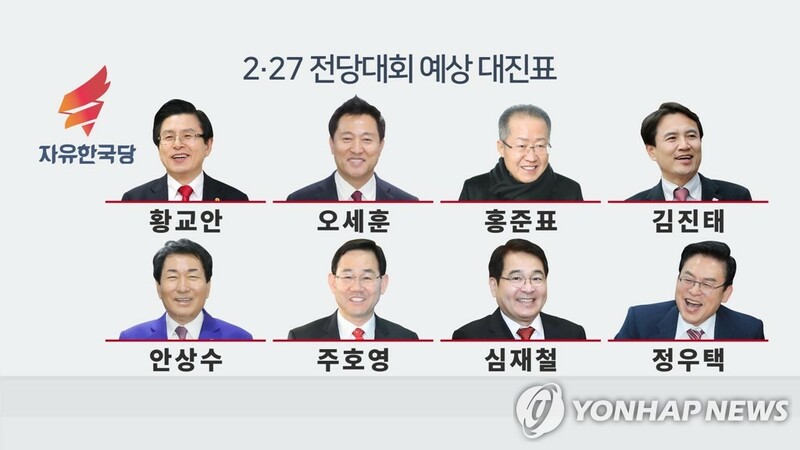 SEOUL, Feb. 11 (Yonhap) -- The main opposition Liberty Korea Party (LKP) reaffirmed Monday that it will hold its leadership election as scheduled late this month after most of the contenders threatened to boycott the event. Six of eight candidates for the LKP's leadership election, slated for Feb. 27, want the conservative party to postpone the event by at least two weeks to avoid a clash with a second summit between the United States and North Korea slated for Feb. 27-28 in Vietnam. But the party rejected their calls once again following a similar meeting last week to review whether to delay a national convention to pick its new leader to replace interim leader Kim Byong-joon. "Whether they will boycott the election is their business, not ours," Park Kwan-yong, the chief of the party's election preparation panel, told reporters after an emergency meeting with panel members. The six contenders, including former LKP chairman Hong Joon-pyo and former Seoul Mayor Oh Se-hoon, said they will not register their candidacy on Tuesday if the party does not reverse its decision. In that case, only Hwang Kyo-ahn, who was prime minister under scandal-stricken President Park Geun-hye, and Rep. Kim Jin-tae, known as a far-right politician, would run in the election. The upcoming election was widely expected to be a race among three big-name candidates -- Hwang, Hong and Oh. But as the election panel reaffirmed no change in the date, Hong said that he will not run in the election. "It is regrettable that I could not run to the end," he said on his Facebook page. The election is a key event facing the LKP ahead of the 2020 parliamentary elections. Internal strife surrounding the election date is likely to make the election fizzle out, as Hwang would then be expected to win the election overwhelmingly. "In that sense, the national convention should be held as scheduled," he noted.